Everyone asks, “How is Ukraine?” I can say one thing for sure, the money ran out, the guys are freezing, every day at least one hero dies in Ukraine. Optimism and confidence in a victory exist only because there are infinite numbers of people who do not give up and keep helping! 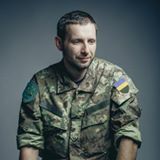 This entry was posted in English, English News, Help for ukrainian army, Pictures, South&Eastern Ukraine, War in Donbas and tagged #RussiaInvadedUkraine, #UkraineUnderAttack, Ukraine, Volodymyr Parasiuk. Bookmark the permalink.